Got an e-mail from a friend of GreaterFalls: “My friend’s two brittany spaniels have been missing in the Riverview Area since yesterday morning. They are both males, liver and white, and white and liver. There is a reward if anyone finds them. 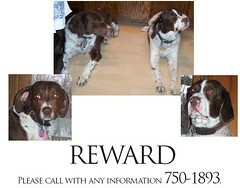 Contact: 750-1893.” If anyone has seen these pups, please call! UPDATE: Here’s a picture of the two dogs. I want to thank you for posting our lost poster on the site. Without you, we wouldn’t have been interviewed by the Tribune which helped us find our dogs! The article prompted people to call and help us locate them. Thank you for the support Great Falls! Sweet! Congrats on finding them Miss M.